Survey websites to Survey Apps everything is running on the internet. Some are good, and most of them are scams. It is not a new thing that people still comes in the trap because it’s our human nature the person who needs money has no option than trusting on what he is doing and because of this scams are not getting stopped in the internet world. Actually what I feel is there should be and special software or company who can stop this scams worldwide and save people from frauds. 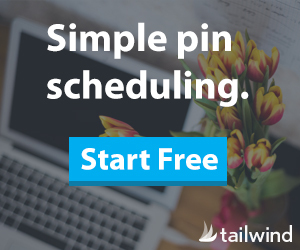 START YOUR FREE ONLINE BIZ! 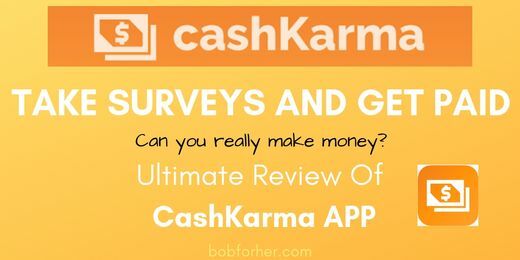 My today’s review is on Cash Karma App which gives money for survey work. 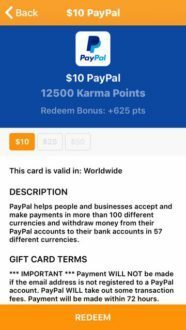 I will let you know about Cash Karma App what it is, how it works, payments, good and bad points. 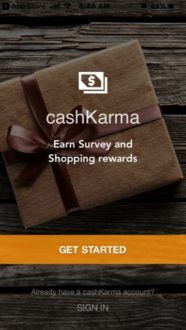 To start on positive note Cash Karma is a legit website and app so no worries in that case. You will get money for your work, and it is free to join. It is available in Android and IOS both you have to download the app from Google Store, and it is rated high in Google Playlist. 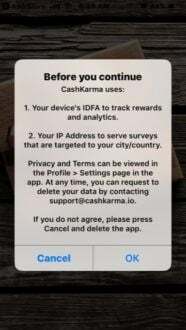 First of all, you have to download the Cash Karma App from your mobile which you can to do it from cash karma download page. For desktop or laptop give your phone number for downloading this app, and you will receive a link to download. Then you can use this App and start working on it by answering their surveys questions and videos and other offers. It is easy to start you; will not find problems any user who knows the internet can work in this app. 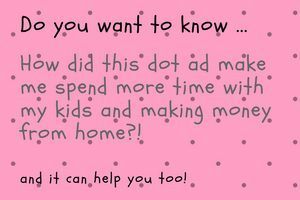 By doing surveys, you will earn money from 200 points to more than 2500 points. 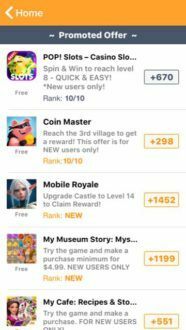 You also get 5 points every 24 hours, and you also get offers and deal. You can earn money by watching videos. This is ads that last between 10 to 30 seconds. By watching them, you will receive a small reward. Cash Karma offers quite a few bonuses and badges. Yes, the amount of money is quite low but good for the people who have nothing on the list, so they will get some motivation when they earn some money. 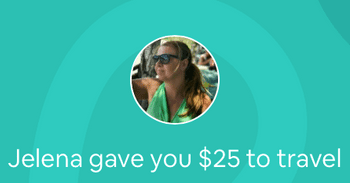 Payout depends on how much you want; it starts $5 and Amazon gift cards. Withdrawing process is similar to some other apps which are withdrawing money after every $10 or 12,500 points. You can withdraw your money on your PayPal account. The payout here is slightly higher than average, which is good, and if you wait until 50,000 points, you get $50. But, Cash Karma’s points system may confuse you. I too got confused in their payout system. 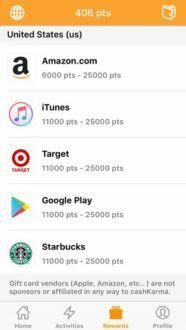 Except for the money, you can also choose some of the gift cards for Amazon, Starbucks, Target, iTunes,.. 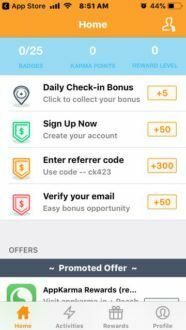 They have made a good looking app, and it also gives you good bucks; let’s say in 30 days you can earn around $20 to $30 not more than that, but it is good if you don’t have anything for work. It gives good pocket money for your startup. But let me tell you don’t expect any big thing from Cash Karma. Cash Karma is rated well in Google Play its above 4.5 which is pretty good but as we know reviews cannot be trusted in today’s time as some of them I found were totally fake. Many of the reviews were same and repetitive, and I`m sure that they are fake and maybe they have done it to earn points from Cash Karma. I have also seen many reviews where people are criticizing this app, and they have shared their bad experience for this App. These people say that app just doesn’t credit your account with points when you complete an offer. You can read some of my reviews that I wrote about different Surveys sites HERE. Customer service in CashCarma is not so good; it is tough to find where to contact them. Which is not good if you face any problem to whom you will speak to. For customer support, you have to go to the website, and there you find their customer support as emailing us an option. As usual like other surveys free to join which is a good technique to attract people. It is a legit company. They give good rewards and bonuses – you can’t be rich but good for time pass. Yes, it is legit, but customer service is terrible – you will rarely get any help. You cannot earn a big amount. So be ready for hard work, and you will get a few bucks in reward. The points system is not good and confusing too. Rewards are not of high standards which is not a good sign for a person who is working hard. 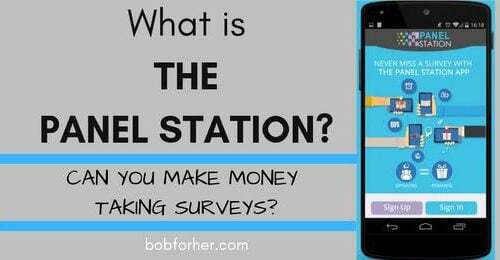 The same old story this Survey site and App take more significant money from their clients, and you get a small commission as rewards for your work. 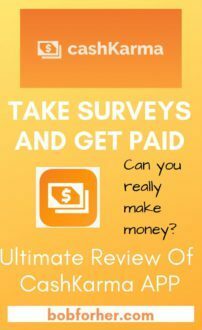 CashKarma App is not a bad thing as it is a legit company, but surveys never help you to earn big in your life. The person who wants to work from home and other places to make extra or huge there are many other options which can be far better than Cash Karma. Some might say it’s paying, but I will say it is just waste of time any man/women, youngster wants to earn money there are many good things available on the internet where you can grow big in your life with your skill. 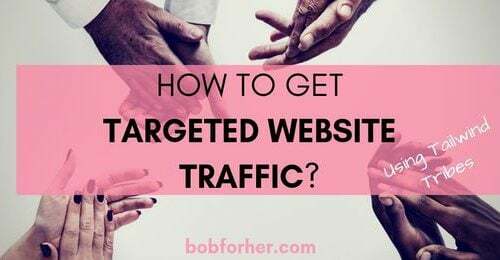 Let us take an example of affiliate marketing where you can start for free, and it is easy to understand, and you get training on every stage. You cannot do new things in Survey work, which is not a good sign, as you will never get progress in your life. 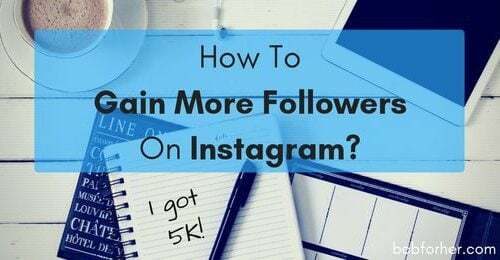 So try something whole as I suggested this free training which will give you an excellent opportunity for growth and you will earn well from 4 figure than 6 figure monthly income and more from it, which is not possible in this kind of Cash Karma survey work. YES! I NEED A FULL-INCOME! So I suggest to everyone who is looking for good work should try affiliate marketing. It is free to start, so try it once, and you will feel good and earn a satisfying amount of money once you start working.